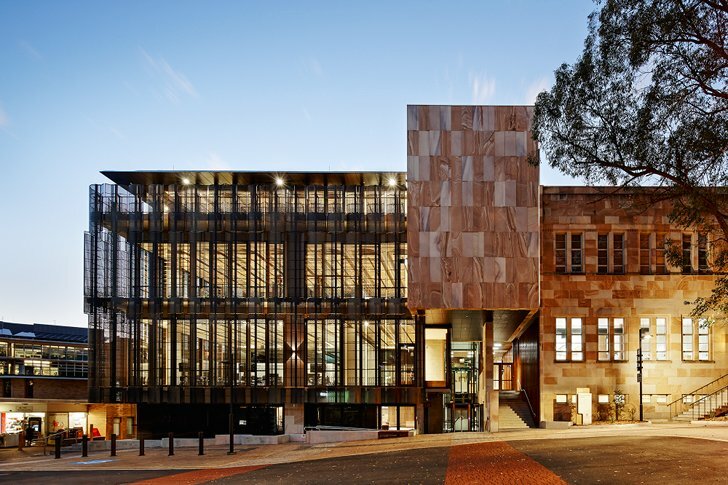 The Global Change Institute at the University of Queensland (UQ) in Brisbane is dedicated to addressing the challenges of a rapidly changing world. To that end, their new facilities are a bold example of sustainable architecture and responsible construction and operation. 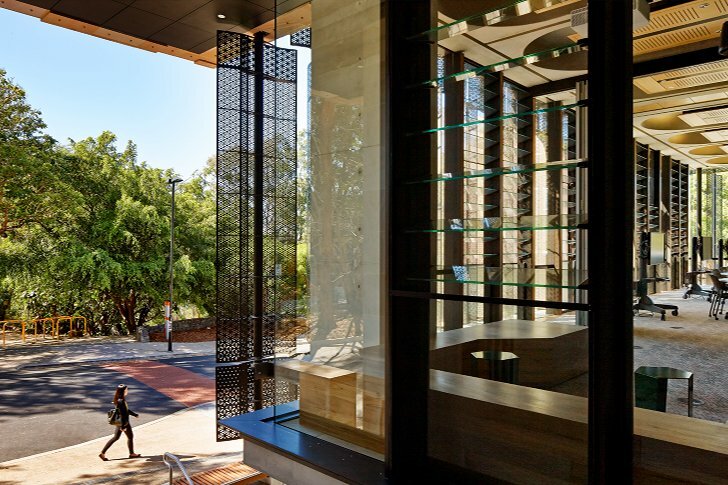 Designed by HASSELL, the GCI's net-zero energy and carbon neutral building will hopefully inspire its researchers to push the boundaries of their work, improve conditions and help reduce the university's environmental impact. Opened in August 2013, the Global Change Institute is a research facility dedicated to finding solutions for global challenges. HASSEL Architects designed the project to ‘walk the walk’ by operating a net-zero energy and carbon neutral building that would inspire employees, scientists and students to come up with smart solutions. The building is designed to operate within the sub-tropical environment; for most of the year it is naturally ventilated. When temperatures creep higher in the summer months, the building goes into a low energy comfort conditioning mode to reduce indoor temps and humidity. The system uses chilled rainwater that runs through exposed sculptural Geopolymer precast floor panels. Humidity is reduced using a heat recovery sensible and dessicant thermal wheel along with an evacuated solar tube water heating system. Solar passive design provides shade and louvered glass panels bring in both natural light and air into the space. The building’s central atrium acts like a set of lungs to bring in fresh air and expel hot air up and out. The atrium also features an ETFE covering that floods the space with daylighting. A living green wall further improves indoor air quality. Collected rainwater is stored in a 60,000 liter cistern that services the hydronic cooling system, kitchen and showers. And a rooftop photovoltaic system generates electricity for the building and excess power is fed back into the grid. Opened in August 2013, the Global Change Institute is a research facility dedicated to finding solutions for global challenges. HASSEL Architects designed the project to 'walk the walk' by operating a net-zero energy and carbon neutral building that would inspire employees, scientists and students to come up with smart solutions. The building is designed to operate in a sub-tropical environment; for most of the year it is naturally ventilated. When temperatures creep higher in the summer months, the building goes into a low energy comfort conditioning mode to reduce indoor temps and humidity. The system uses chilled rainwater that runs through exposed sculptural Geopolymer precast floor panels. Humidity is reduced using a heat recovery sensible and dessicant thermal wheel along with an evacuated solar tube water heating system. Solar passive design provides shade for the building and louvered glass panels bring in both natural light and air into the space. The building's central atrium acts like a set of lungs to bring in fresh air inside and expel hot air up and out. The atrium also features an ETFE covering that floods the space with daylighting. Finally a rooftop photovoltaic system generates electricity, and any excess power is fed back into the grid. A living green wall further improves indoor air quality. Collected rainwater is stored in a 60,000 liters cistern that services the hydronic cooling system, kitchen and showers. "The building moves away from a framework of consumption of the world's resources to one that contributes to the restoration and regeneration of the environment. The building will produce more pollution-free energy than it consumes and be carbon neutral in operation," said HASSELL Principal Mark Roehrs. "It is able to act as a live research site, with the building systems and occupants used to assess comfort conditions in low-energy buildings for the sub-tropics."